This conference is available via live webinar! Webinar attendance allows you to stream NUNM Continuing Education events in real time on your computer or personal device. Webinar attendees can receive CE credits for live participation. A webinar moderator will be present to provide technical assistance as needed. 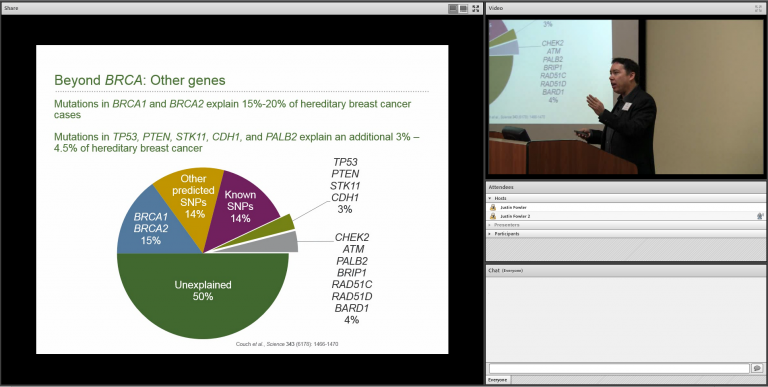 Below is a screenshot of our live webinar; an example of what this will look like during a live event! For an optimal viewing experience, you will need a connection speed of 10 Mbps or above. Please test your computer’s compatibility and connection speed prior to purchasing your webinar registration. Note that the Adobe Connect add-in (step 4) is not required to view the webinar, but installing the add-in will allow you to open the webinar in a separate window and may improve your experience. If your connection is not rated as “LAN speed” on step three, please use the Speedtest website to verify that your download speed is 10 Mbps or above. If your connection is slower than 10 Mbps, consider contacting your internet service provider for assistance, or switching to a faster connection. Certain web browsers, such as Safari, require advanced configuration to access Adobe Connect. We recommend using Google Chrome or Mozilla Firefox to access the webinar for improved stability and ease of use. *For Chinese medicine practitioners, please note that our recordings are not currently valid for PDA points.